This flawless, clear, contemporary vase frames and refracts light. Its square design and solid presence are reassuring reminders: welcome home. Casual, simple living every day. Swirling up to a ruffled rim, the Chelsea Optic Cinched Vase is full-bodied, generous, curvaceous, and ready for lilies and lilacs. Handmade in America by Simon Pearce glassblowers. Created from pure, lead-free glass using centuries-old techniques. Your favorite Hibiscus Bud Vase in opagque white glass perfect for seasonal blooms from the garden. Just pop them in! Mix and match with green and clear of various sizes for amazing effect. Photo coming soon… your favorite Hibiscus vase in an opaque white glass. Simply elegant and what an amazing gift. 7-piece set. 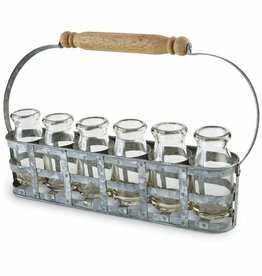 Galvanized tin vase caddy features six removable glass mini milk bottles and mango wood handle. Mouthblown in Italy, the Hibiscus Medium Fluted Vase expresses joy and happiness, inspired by the delicate Hibiscus flower. A beautiful complement to any room, this collection is both elegant and graceful. This gold pedestal can be used a a vase or a planter. Stunning new "twist" on the Woodbury vase. Flowers or no flowers, this is a feast for the eyes. Handmade mouthblown glass. Each piece unique. Made in the US by Simon Pearce glassblowers. Mouthblown glass transforms into the graceful Hibiscus Large Fluted Vase, as delicate petals dance around the top expressing joy and happiness. Versatile and elegant, this collection is a lovely accent to your coffee table or dining room. Dimensions: 13" H x 7 1/2" Diameter. Stoneware. The Forma Cloud Round Vase is handformed in Veneto, Italy. 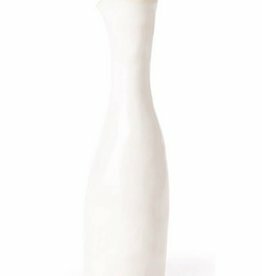 With its elegant shape and rich, white glaze, the vase looks beautiful with colorful and white blooms alike. Stoneware. 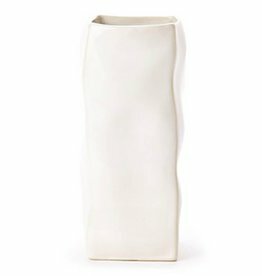 The Forma Cloud Square Vase is a sophisticated, sculptural statement piece for your home. Handformed from the strongest Italian stoneware in Veneto, Italy, this vase looks stunning with white and colorful blooms alike. Absolutely the perfect vase for camellia blooms! This clear-as-ice glass reflects light so beautifully, complimenting the blooms it cradles. Woodbury Vase - Large - 80 Oz. If only all edges were so subtle, all shapes so distinctive and unforgettable. 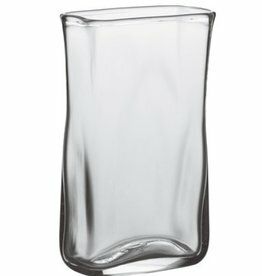 The spare elegance of the Woodbury Rectangular Vase does a modern tango on any table with the Woodbury Pitcher. Effortless as a master glassblower spinning molten glass on the pontil iron. The ruffled rim frames the stem; blooms balance and are embraced by the brilliant lip of this innovative vase. Delight in the soft, delicate petals that dance around the top of the Hibiscus Small Fluted Vase. Versatile and elegant, this collection is a lovely accent to your coffee table or nightstand in your guest bedroom. Simplicity gives rise to versatility, making the Newbury Vase equally stunning whether filled with a single cutting, an overflowing bouquet, or as a stand-alone statement. Fill this heart-shaped vase with flowers or baubles or love. A heartfelt gift for any occasion. For the one you love. An excellent house gift (or birthday, thank you, or just-because-you-feel-like-it present), these vases are charming on a windowsill or mantel, with a different colored bloom or textured leaf. The distinctive twist embraces flowers and ferns. The spare elegance of our Woodbury Bud Vase make it a favorite for customers around the world. Nestled in Simon Pearce’s distinctive box, it makes a gift that will become an essential part of any home. Woodbury Bud Vase in Gift Box - 8 Oz. Our long-awaited Lastra Aqua has arrived. The rustic yet chic shape of the aqua medium vase is a clean and sophisticated gift. Handformed in Tuscany of Italian stoneware. Microwave, oven, freezer, and dishwasher safe.